Election lawyer Romulo Macalintal criticizes Marcos’ move that asks the Supreme Court to speed up the election protest process as “very premature.” He said suspiciously that it only aimed at priming the public and the 15-member PET to believe his claims that he was the real winner of the VP post before it is formally heard. [VIDEO]: Pinaghahanda na ang kampo nina dating Sen. Bongbong Marcos at VP Leni Robredo ng listahan ng mga testigo at mungkahi para sa mabilis na retrieval ng mga balota na kailangan sa election protest. George Erwin Garcia, Marcos’ lawyer said that doing so as suggested enables hearing commissioners to facilitate better. This can result in orderly, simplified and expeditious manner. Since there are three causes of action in this election protest, it is best to have three officers as well to avoid confusion. Macalintal disagrees with Marcos’ motion because PET has yet to decide how to deal with the three main issues that Marcos included in his election protest. It also has to act on the pending resolutions they submitted. 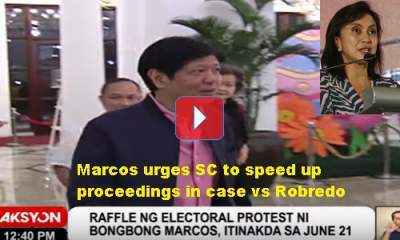 Marcos’ lawyer, Vic Rodriguez referred to them earlier as their delaying tactics. Robredo’s lawyer also thinks that it is impractical for the tribunal to grant the petition of Marcos as both parties only have one lead lawyer to handle the three major issues of Marcos’ electoral protest. “Surely, the lead lawyer has to be present in every hearing and cannot be in three places at the same time. The issues also are all interconnected. It is just improper for three hearing officers to deal with the issues separately,” Macalintal explained. Previous post: Will the President Give In to the Save Sulu Movement’s Challenge to Declare Martial Law?